Offering unparalleled, transformational mind body programs within an inspiring yet relaxing sanctuary. We live and breathe the yin and the yang, believing that when energy shifts, transformation results. We follow the breath, which both invigorates and calms, connecting mind and body and opening us up to positive change. Our guests revive with our award-winning series of Core Fusion and yoga classes, all exclusive to exhale and all physically and mentally challenging. They restore with our complete menu of spa therapies and services, which perfectly leverage ancient and new spa practices alike. Together these offerings allow for the perfect balance. Revive. Restore. Exhale. Visit and experience the markets of Boston’s North End. The secret of Italian cuisine is the high quality of ingredients, a sense of regional tradition, and that very Italian love of life. Sources for ingredients abound in the narrow streets of the North End. But for the outsider, finding the finest isn’t always easy. Join us on Michele Topor’s original award-winning North End Market Tour and let us unlock for you the secrets of the cuisine and of America’s oldest Italian community while you enjoy the colorful sights, the tantalizing aromas and authentic tastes of America’s most vibrant Italian neighborhood. Make a splash! 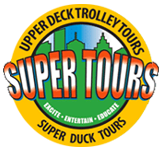 Super Duck Tours is the only amphibious tour to bring you through Boston Harbor, the doorway to the new world and the birthplace of American liberty and commerce. For landlubbers, also available are our custom, climate-controlled, high-riding trolleys that ensure you see above traffic to 400 years of Boston history. Come and see Boston as only SUPER TOURS can show it to you. Explore Boston from her streets to her waterfront.